Professor Max Häggblom and his team of researcher received a R3C mini-grant to investigate the biodegradability of pharmaceuticals and personal care products in Raritan River Sediments. The team was comprised of Dr. Häggblom (Dept. Biochemistry and Microbiology, SEBS), Professor Lee Kerkhof (Dept. Marine & Coastal Sciences, SEBS), Professor Donna Fennel (Dept. Environmental Sciences, SEBS), Dr. Shen Yu (Chinese Academy of Sciences, Institute of Urban Environment, Xiamen, China), Dr. Aamani Rupakula (Dept. of Biochemistry and Microbiology, SEBS), Michelle Zeliph (Dept. Biochemistry and Microbiology, SEBS), and undergraduate students Alex Mossavir, Samuel Wieczerzak and Albert Enriquez. Pharmaceuticals and personal care products (PPCPs) include a diverse array of thousands of chemical substances, including prescription and over-the-counter therapeutic drugs, veterinary drugs, fragrances, and cosmetics. These compounds are released directly or indirectly to the environment, but their long-term fate is poorly understood. Over the past decades PPCPs have emerged as a major group of environmental contaminants in numerous watersheds around the world. The continued introduction of new chemicals into the environment, such as the discharge of a plethora of PPCPs, requires new understanding of their behavior and environmental impact. PPCPs enter the environment through a variety of routes, but the primary pathway is through incomplete removal during the wastewater treatment process. They are biologically active and can thus pose adverse effects to aquatic biota. The goal of this research is to investigate the role of potential for biodegradation of PPCPs, using the Raritan River watershed as a model. Water and sediment sampling sites along Raritan watershed. 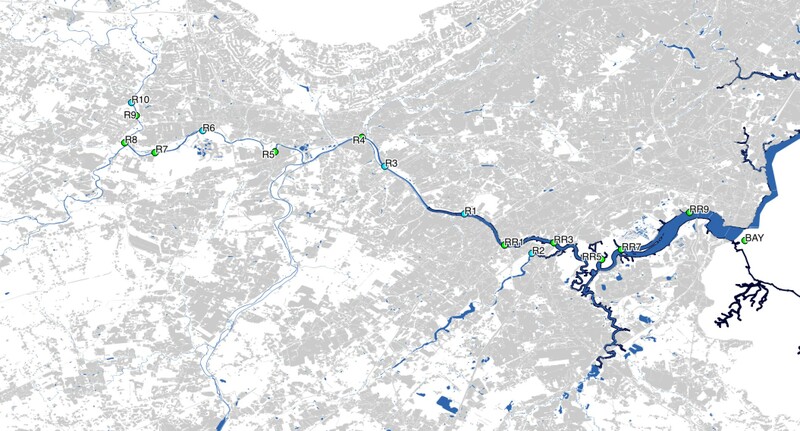 R4B is downstream and R5B is Upstream of SRVSA is the Somerset-Raritan Valley Sewerage Authority. RR1, RR3, RR5 are UP and RR7, RR9 are downstream of SWD (Sayreville Water department). R1, R3, R4 are downstream and R9, R10 are upstream of RTMUA (Raritan Township Municipal Utilities Authority). R2 was collected upstream of the East Brunswick Water Utility treatment intake location. BAY represents Raritan Bay sampling site. While there is an increasing body of work examining the fate of PPCPs in wastewater treatment plants (WWTPs) there has been less attention to factors affecting their biodegradability in the environment. PPCPs exit WWTPs largely untreated, but little is known about their fate in aquatic systems, in particular under anoxic conditions of the water column and sediment. This is a fundamental gap in our knowledge. An understanding of the factors affecting the fate and effects of PPCPs and their transformation products is needed to inform policies aimed at protecting aquatic ecosystems. The overall research goal is to determine the biodegradability and environmental fate of PPCPs and their metabolites. The team postulates that the redox environment, and the availability of alternate electron acceptors, such as sulfate in estuarine sediments in Raritan river, will control the activity of microorganisms active in PPCP degradation. The specific objectives for the Raritan River Consortium Mini-Grant is to determine how the redox environment along the Raritan river impacts the biodegradability of a suite of PPCP compounds in anoxic sediments of the Raritan River comparing and contrasting, freshwater (and less impacted) sites with estuarine (and more polluted) sites at the mouth of the river. This work will lay the foundation for determining how the redox environment impacts biodegradability of PPCPs. The longer-term goal of identifying novel anaerobic bacteria and their functional genes encoding for the enzymes responsible for the transformation/degradation of specific PPCPs in aquatic sediments in order to develop tools for monitoring the natural attenuation of these chemicals. Monitoring tools are key in gaining an understanding of how microbial processes, and thus remediation, are affected by different engineering approaches. Identification of the microorganisms mediating anaerobic degradation of different PPCP compounds will provide new bioindicators that allow for a more detailed assessment and monitoring of important microbial processes for use in combination with chemical monitoring. The team is assessing the potential for microbial degradation and biotransformation of select PCPPs through sediment microcosms from Raritan River locations representing a range of PCPP exposures from rural to urbanized areas, and freshwater to estuarine habitats, targeting sites upstream/downstream from WWTP discharge, as well as sampling the WWTP influent and effluents to identify the contribution of raw or treated sewage input. Anaerobic biodegradation of aspirin, acetaminophen under different redox conditions in Raritan River sediment microcosms. Sediment samples from the Raritan river sites were collected during the R/V Rutgers boat trips, and microcosms established to assess the potential for microbial degradation and biotransformation of selected PCPPs. Initial studies have focused on select analgesic and antipyretic pharmaceuticals: aspirin, ibuprofen, acetaminophen and diclofenac. These are among the most abundant PPCP compounds detected in NJ sewage wastewater (preliminary data). Because of their widespread and frequent use, understanding the environmental fate and ecotoxicity of these compounds and their transformation products is essential. Microcosm results show anaerobic biodegradation of aspirin and acetaminophen, implying the presence of PPCP-degrading bacteria in the Raritan River sediments. However, so far ibuprofen and diclofenac are resistant to anaeobic biodegradation. Ongoing work is focused on identifying the bacterial community members active in anaerobic degradation of PPCP compounds. The study is supported in part by the Rutgers Raritan River Consortium, the Hudson River Foundation, and the New Jersey Agricultural Experiment Station. The research team thanks the Raritan RTMUA WWTP (Jennifer Loudon) and Passaic PVSC WWTP for providing samples for research, Beth Ravit and Josh Kohut for assistance with sampling along the Raritan River.